Here’s what’s up in the world of TV for Thursday, November 3. All times are Eastern. 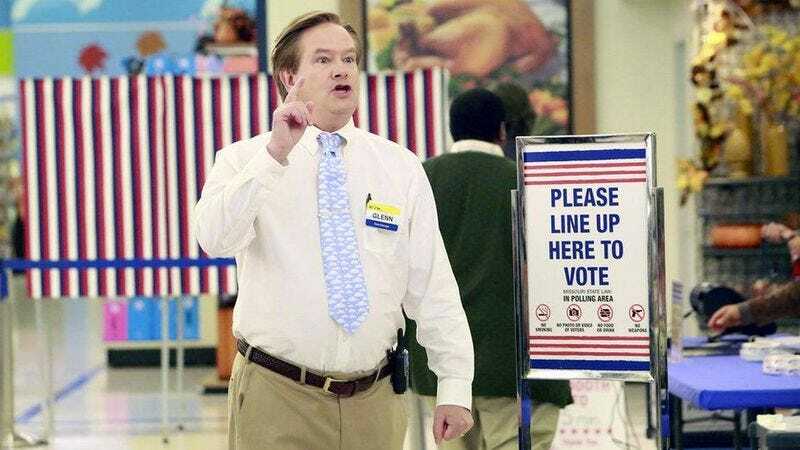 Superstore (NBC, 8 p.m.): We’re dropping in on Superstore just in time for the show’s Election Day special. “Scandals erupt” when Cloud 9 is designated a polling place. Amy and Jonah push back against a self-serving voting guide from corporate, Dina and Glenn accidentally destroy some ballots, and Mateo tries to hide his status as an undocumented immigrant. In other words, it sounds much more restrained and civilized than our own real-life election season. Legends Of Tomorrow (The CW, 8 p.m.): The team travels to 1863 to deal with a time aberration. According to TV Guide, the Legends have to “fight for survival during the Civil War with Confederate soldiers who have been turned into zombies.” Confederate zombies?!? If that’s not a premise to get excited about, we don’t know what is. Elsewhere, Jax and Amaya risk their lives by completing a dangerous mission on a plantation. Plus, the Civil War outcome hangs in the balance so, you know, no pressure. Although, if the Legends aren’t able to save history, we’re sure those guys from Timeless could pop on over and straighten things out. Hell, they’ve already got the costumes. Pitch (Fox, 9 p.m.): Pitch explores that age-old adage “girls just wanna have fun” as Ginny ditches the fancy party celebrating her new Nike campaign for a wild night of rebellion. According to the episode’s preview, that means beer pong and pool basketball, which doesn’t sound too rebellious to us. Nevertheless, she’s forced to attend a mandatory session with her therapist. Will that finally allow the show to fold in its flashbacks better than it has so far? RuPaul’s Drag Race: Ruvealed (Logo, 8 p.m.): Determined to milk the Drag Race franchise for all it’s worth, the Ruvealed edition of the show allows RuPaul to pop in pop-up video style to comment on past seasons. Season six gets the Ruvealed treatment this time around, so get ready to relive all the shade from 2014. Impractical Jokers (TruTV, 8 p.m.): The hosts of this TruTV prank show team up with the “action sports collective” Nitro Circus for a live fifth-season finale featuring an “over-the-top” four-part obstacle course. The finale is set to last a whopping two hours and 15 minutes, so get ready for a whole lotta pranks. The Good Place (NBC, 8:30 p.m.): While it’s not wrapping up its first season just yet, The Good Place does reach its fall finale tonight. But not before the members of The Bad Place stir up a little trouble. Led by a dickish Adam Scott, The Bad Place residents cause mischief and mayhem while Michael tries to straighten out the whole Eleanor situation. Dennis Perkins continues to be impressed with the fact that The Good Place isn’t afraid to raise the stakes in a big way. And given how fond the show is of last-minute twists, there’s no telling just how crazy things will get in the final moments of tonight’s episode. Finding Prince Charming (Logo, 9 p.m.): Logo’s gay riff on The Bachelor is coming to a close tonight. Eligible bachelor Robert picks one of the final three suitors to be his prince charming. Or maybe he’s their prince charming? Probably both, come to think of it. Regardless of whether the show’s final couple actually finds true love on TV, Logo’s already renewed the show for a second season. Parks And Recreation, “Win, Lose, Or Draw” (Netflix): If Superstore’s election isn’t quite your speed, revisit the one from the fourth season of Parks And Rec. You know, the one that’s basically a perfect mirror image of the 2016 presidential election. Here’s hoping the real one ends the same way, too.